Meiji 4 Map of Japan. This very rare item is a hand colored Meiji Period woodcut map of Japan. Impressive size and detail. Produced in the late 19th century Japanese woodcut style, this map is a rare combination of practical and decorative. All text in Japanese. 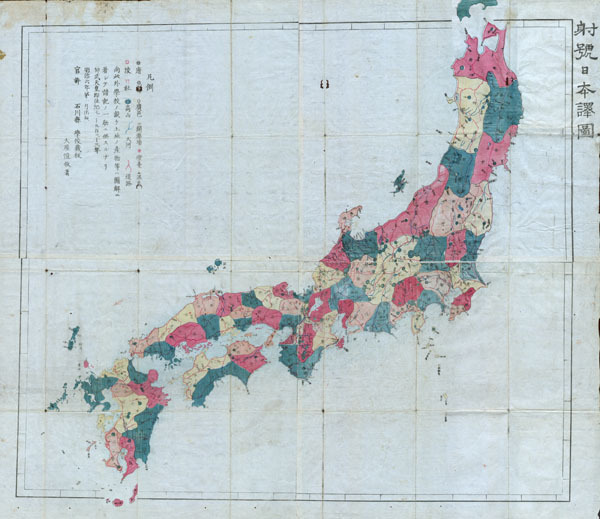 A fine example from the Meiji period of Japanese cartography and an very rare piece. Very good condition. Folds into original covers. Minor wormholes here an there – mostly on corners – see image. Good margins. Blank on verso.